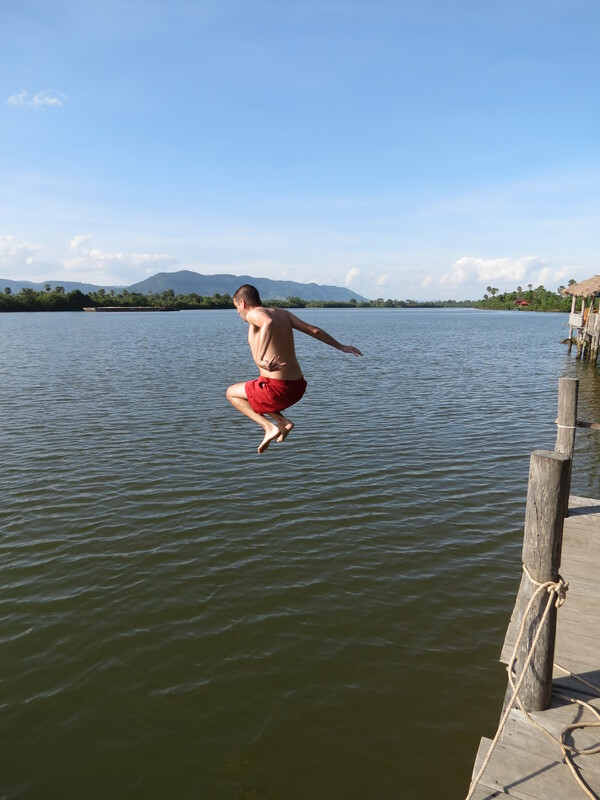 The two day trip down the Mekong was not really what we expected. I had visions of Apocalypse Now, drifting down a quiet and beautiful setting of the Mekong Delta. Instead we spent most of our time on a bus rather than the river itself. When we were eventually on the river, we were taken to a local floating market, which was closed. Apparently the market opens very early in the morning so the locals can get everything they need for their daily trading. It does beg the question as to why we went there in the knowledge that it would be closed, but who are we to argue. We were taken to a small village where they are famous for making their alternative to chocolate, a coconut candy. Here we were also shown how they make rice paper for their spring rolls and various other things, before heading to lunch. 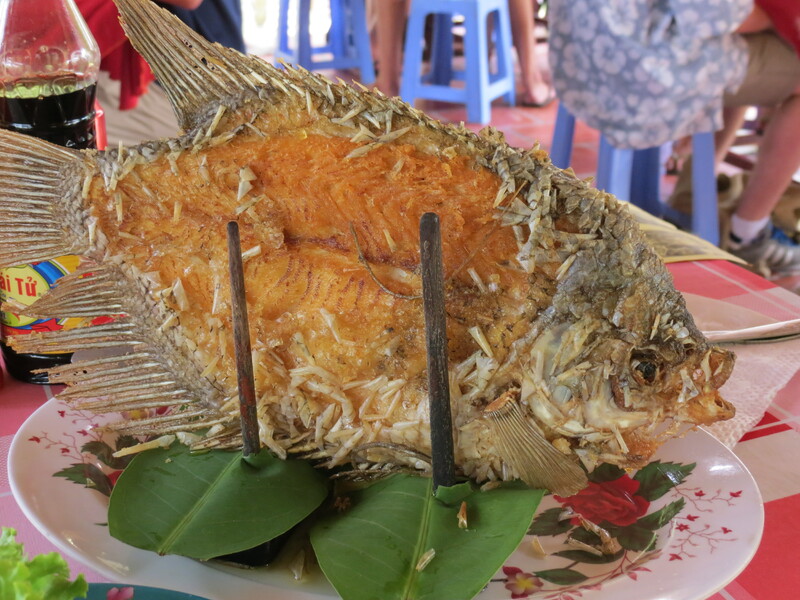 Katy and I enjoyed an Elephant fish, where we made our own spring rolls. We also stopped in to a crocodile farm which housed over 15,000 crocs. They are no longer really found in the Mekong as so many locals capture them to make these farms for meat and their skin. By that point we were ready to get to our hotel for the night, which was a floating hotel in Chau Doc near the Cambodian border. The night was pretty uneventful until a full scale thunderstorm hit us. As the entire hotel bobbed up and down on the river, Katy frantically asked me “the hotel isn’t going to float away is it?” Thankfully we survived the night, and awoke to calm waters and clear skies. When we got to the Cambodian border the next day, it consisted of a ridiculous foot bridge that looked older than I am. It almost makes our border control look competent. What we did notice after crossing the border though was how much nicer the river was. Everything was cleaner, greener and the river wasn’t used as a personal dumping ground as on the Vietnamese side. We arrived in Phnom Penh weary but excited about being somewhere new. First impressions were that it was much more laid back than anywhere we had been so far. What shocked us is that it was more expensive than Vietnam. Don’t get me wrong, it is still cheap with beers averaging $0.75, and meals $5. 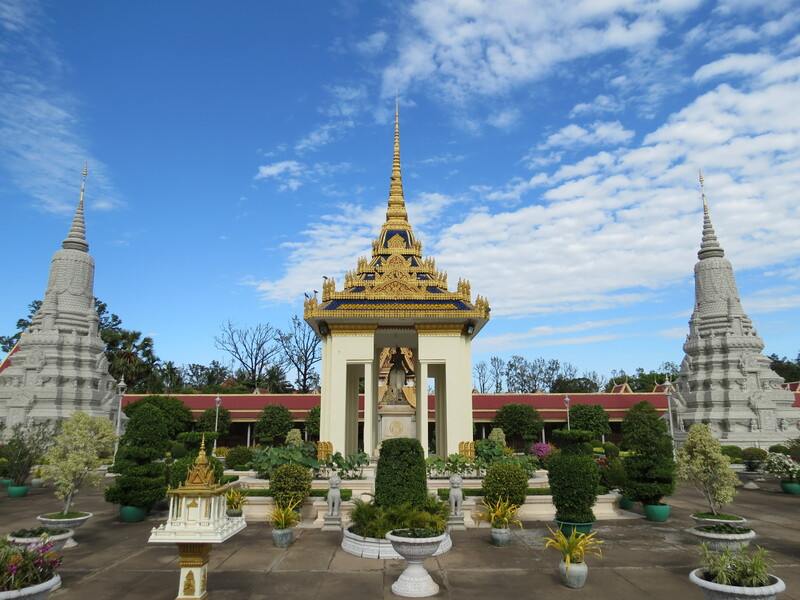 We were in Phnom Penh for four nights, and in that time we saw the Royal Palace and a few other sights as we walked around the city. Katy also took me to another 15 markets, where we spent hours looking for replacement clothes for her, as she is already bored of what she has got. Most nights were spent by the river in bars or restaurants, where there is a fairly lively crowd. The FCC is a famous bar on the front where all of the journalists hung out during the war, and it’s a great place to sit for some cheap beers at sunset. We also visited the Killing Fields, where 20,000 bodies were discovered. Although rather morbid, it was an interesting place to walk around and learn a bit of history. 3 Million people were killed in total from a population of 8 Million, which is quite hard to comprehend. After Phnom Penh we headed to the coast, and a 7 hour bus journey to little town called Kampot. It’s famous for its green peppercorns, and Cambodia’s only vineyard. Other than that there is very little to do other than chill out and relax. We stayed in a lovely place right on the river, and although we had a room with no power for the first night, it was a great place to stay. We cycled into the town for a quick look around, although there is not a huge amount to see other than a huge Durian monument, which is quite bizarre. We went swimming in the river, played some badminton, found frogs in our bathroom and dinner each night was whatever they had bought from the market that day. We were only there two nights before heading off to an island for some beach time. 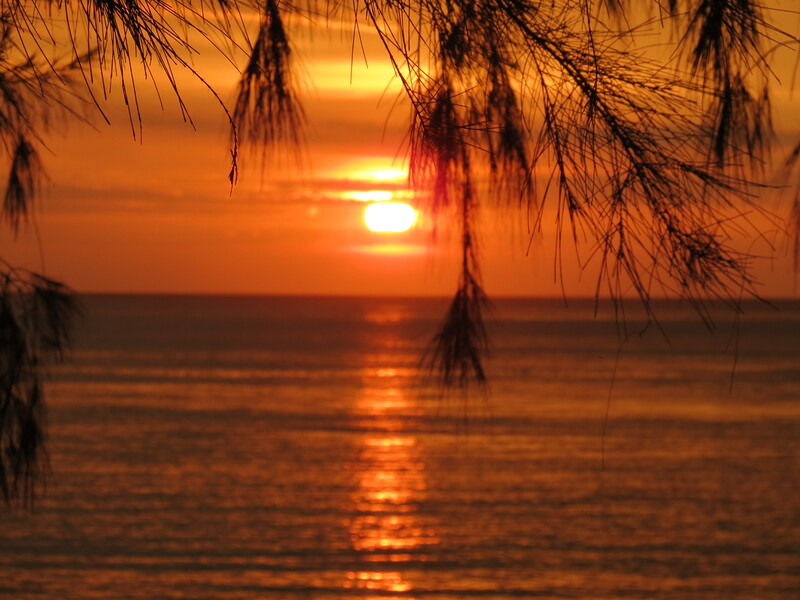 After Kampot we left for Otres Beach in Sihanoukville. This was a quiet beach of about ten beach bars, and we stayed in a funny place called Mushroom Point where all rooms were designed around mushrooms…quirky but expensive. We got chatting to one of the Cambodian beach bar owners, Joe, who taught us some local lingo in exchange for some cockney rhyming slang. He also wrote our names in Cambodian, and told me that my name means that I don’t stop talking and tend to repeat myself, and tend to repeat myself. Bamboo Island (or Koh Russei) had been recommended to us by my friend Alex. We also happened to meet the owner of the resort (if you can call it that) in our hostel in Phnom Penh. Everyone told us how nice it was and that we should go there. The bungalows consisted of a bed…that’s it. The showers and toilets were 100 meters down the beach. Having a shower and then having to walk through sand back to the room just makes no sense to me. There is only electric for about five hours per day, and in the bar only. Toilets are rated in a different way in places like this, as these didn’t have a lock, a flush, the sink didn’t have a waste pipe, no soap and nothing to dry your hands on. But all in all, they weren’t bad. But all of that was forgotten when we sat in our little beach bungalow and the sea was only 10 meters away. There were only about 30 people on the entire Island, so the beach was pretty much deserted. The bar was lively at night, serving good food and drinks with great music in the background. We also bumped into a friend that we met in Beijing on our last night (small world), and we watched the most amazing sunset over a few beers. Today we have arrived in Battambang after a night in Phnom Penh (to break up the journey). It’s another fairly small city, but we have just bought tickets to go to the Friendship Music Festival tomorrow. It will be interesting to see what a Cambodian festival is like. Glad you are ok and having fun in the sun. it is freezing in Barrow. Off to Bolsover to deliver latest blog!